Citrus flavor goes excellent with poultry and this is a recipe that is sure to please. Lemon Rosemary Chicken. First thing to do is pre-heat your cooker to 300 degrees F. The preparation for this cook goes fairly quickly and this way your cooker will be ready to go when prep is complete. Start by stripping the needle off of two large sprigs of Rosemary. Using a sharp knife finely chop the rosemary. 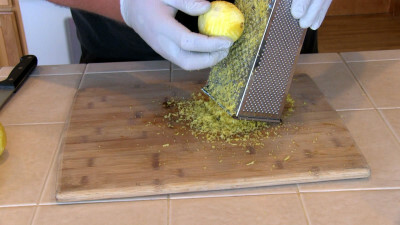 Next using a fine grater, grate the zest off of four lemons. Set the Zest aside and peel four cloves of garlic. Finely mince the garlic. I use a slap chop to quickly do this. Soften 1/2 cup of butter in a medium mixing bowl. Add the following ingredients. Stir the ingredients thoroughly into the butter. Wash a five to six pound Chicken and pat it dry. Season to taste with coarse ground black pepper and coarse sea salt. Make sure to apply some under the skin on the breast and leg meat. 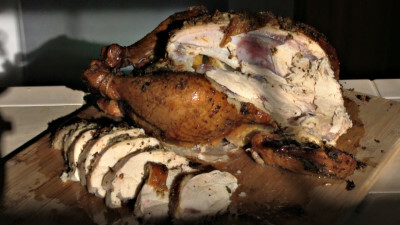 Rub the butter mixture all over the outside of the bird as well as under the skin on the breasts and legs. Leave a little to baste with. 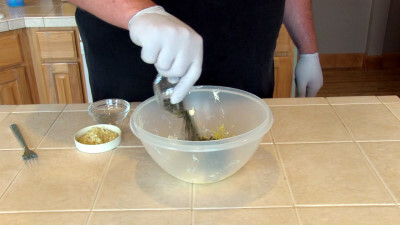 Squeeze the juice of two lemons over the entire chicken. Apply salt and Pepper to taste. Slice the remaining two lemons. Slice two thick slices of a sweet onion and then cut into 1/4ths. Apply salt and pepper to the lemon slices and onions and then stuff them into the birds gavity. Using tooth picks pin the Wings up to the bird. Using cooking string, tie the legs back behind the bird. Place the bird into a aluminum pan and place the bird into your pre-heated cooker. You will cook the bird @ 300 degrees F until the bird reaches an internal temp of 173 degrees or the temp you desire which should be at least 165 degrees F.
In this cook I'm cooking on the Yoder YS640 pellet smoker & grill. 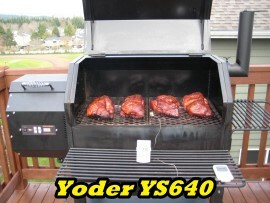 In the Yoder I'm using the Amaze-N-Tube-Smoker by Amaze-N-Products for extra smoke flavor. 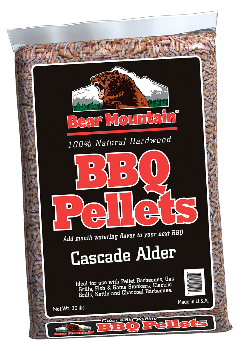 I'm burning Bear Mountain Cascade Alder BBQ pellets in both the Yoder and the Amaze-N-Tube-Smoker. After the bird has cooked for an hour baste the bird with the leftover butter mixture. 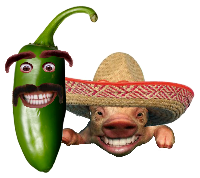 Continue cooking. 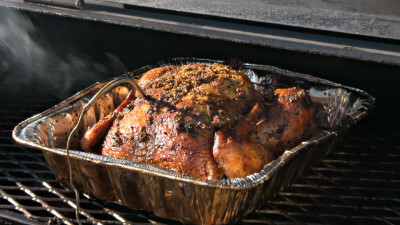 Once the bird reaches 173 degrees or your desired target temp, remove the bird and let it stand, covered in foil, for 10 minutes. After the bird has rested carve that bird up and plate up the meat. Serve with garlic mash potatoes or sides of your choice.